Gudi Padwa happened last weekend and I cooked up a storm for the day. Gudi Padwa is the new year for Maharashtrians and is usually celebrated by making pounds of Shrikhand (spiced sweetened hung curd). 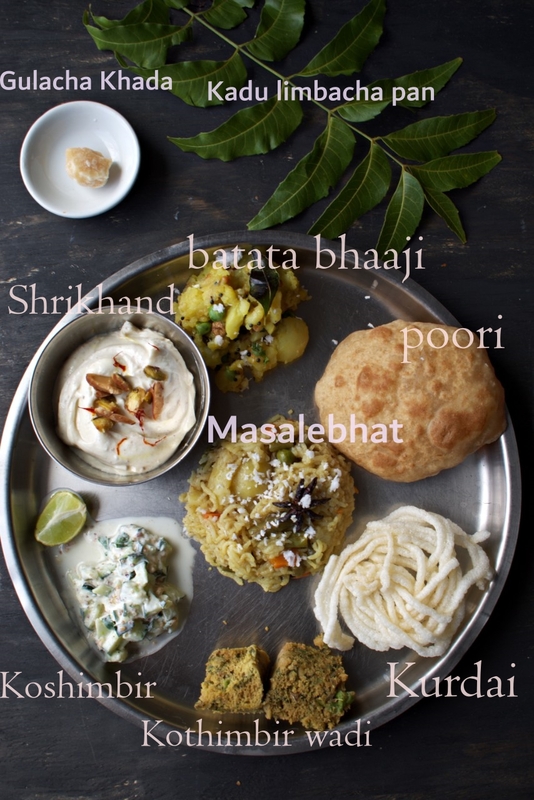 So I cooked up Gudi Padwa special menu which had plenty of food items that were specially made for Gudi Pooja. You may ask me what’s Gudi Pooja? People in Maharashtra hoist a Gudi on Gudi Padwa to mark the victorious return of Lord Rama to Ayodhya and also the victory of Marathas (natives of Maharashtra/warriors and clan of Chatrapati Shivaji Maharaj). 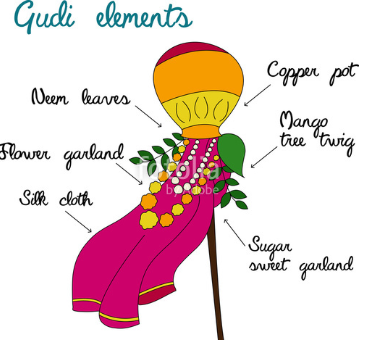 This Gudi is built using a long wooden stick over which a shiny fabric is placed. This is then decorated with neem leaves, mango leaves and necklaces and flower garlands and then a copper glass is mounted upside down on it. Every house hoists their Gudi at the tallest position of their house. There is a peculiar sweet garland that is put over this Gudi which is called gaathi. By now, you might know that I love cooking Maharashtrian food. Like most Hindus, I avoid using garlic and onions in food which is offered to God. S0 everything was void of onions and garlic. You can see the plate below and the details of the plate. Doesn’t it look delicious? What is Ukadlelya batatyachi bhaaji? 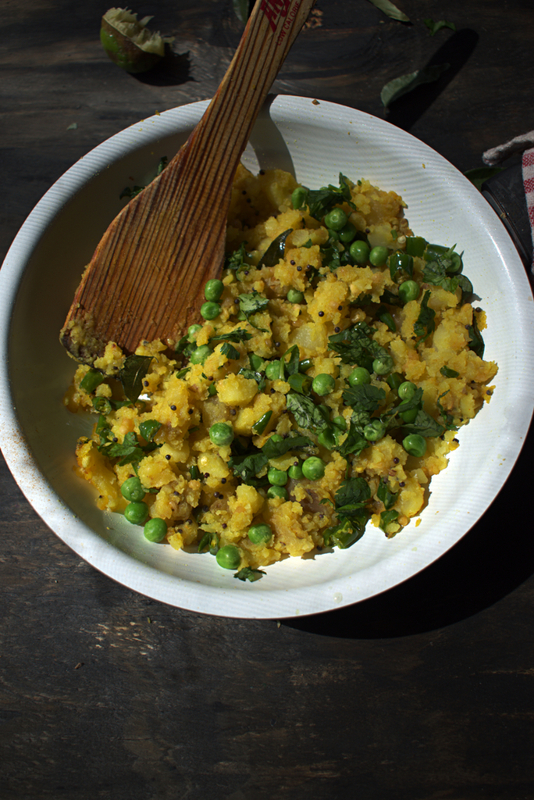 Ukadlelya batatyachi bhaaji is boiled potatoes that are mashed and tempered. 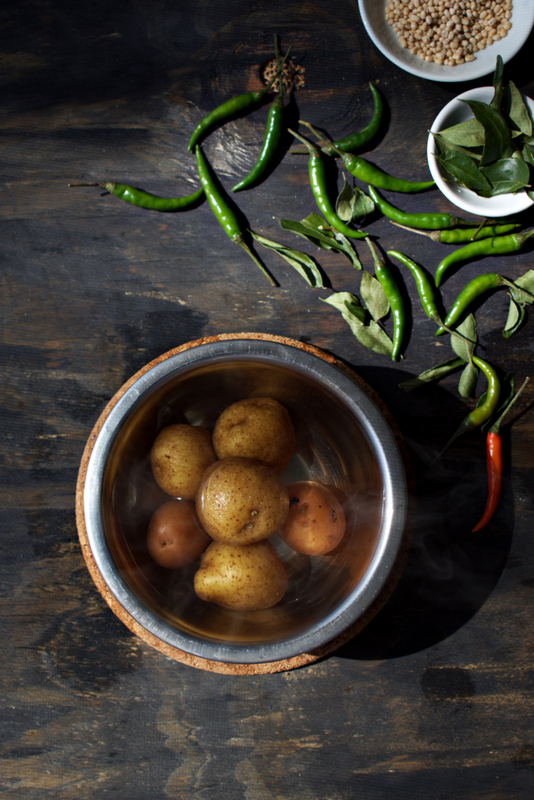 We have all grown up eating potatoes and to this day, the magic of potatoes has not faded. 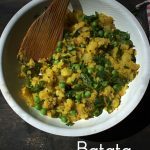 This bhaaji is the classic recipe of Maharashtrians and is made everytime there is festival at home and is paired with Pooris. There is no fancy spice blend or magical ingredients, just simple tempered mashed potatoes and trust me they taste delicious. Boil potatoes in pressure cooker for 2 whistles. Once cooked, cool down the potatoes, peel them and mash them with hand or masher to lumpy texture. In a deep pan, add oil and heat it on medium flame. Once the oil heats, add mustard/cumin seeds and let it crackle. Once seeds are cracked, add curry leaves and chilies. Then add hing and grated ginger and let them get slightly toasted. Wash Urad dal and drain all the water. 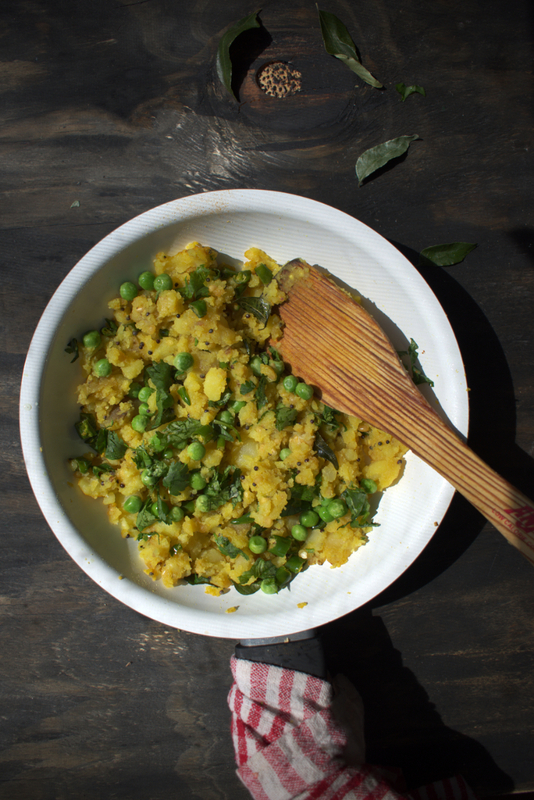 To this pan, add 2 tbsp of washed Urad dal and toast it until golden brown. Once the dal looks brown, lower the heat of flame and add turmeric and immediately add mashed potatoes. Add salt as per taste and mix everything together. Sprinkle lemon juice, garnish with chopped coriander and serve. You can add peas to this bhaaji. I would suggest you to steam the peas if using fresh peas and boil them for 10 mins in water in an open pan, drain the water and add them to the potato bhaaji at the end. If using canned, wash and add directly. I have given a choice of cumin/mustard seeds because each of the seeds impart a different flavor.